I remember something that was taught. I think it was said at the ladies retreat and/or perhaps on a Wednesday night meeting, but probably not on Sunday (because Sunday’s messages were recorded???). Anyway, the topic was about men/boys wearing the color pink. We were told that pink was a “feminine” color and men/boys ought not to be wearing those colors. I don’t ever recall reading anything of the sort in the Bible. Anywhere. I couldn’t even make up something like that. What in the world does a man wearing pink have to do with the love of Christ and sharing the Gospel? Nothing. It’s extra made-up nonsense. You can buy this shirt from Zazzle for $18.95. After the ladies retreat, I remember looking through my son’s drawer and seeing a pink shirt. This particular son is a redhead with an angelic white porcelain face. He looks amazing in pink. I want to squeeze him when I see how cute he looks in that color. The pink against his cheeks and red hair was a beautiful sight to his mama’s eyes. There was no way I was going to throw that shirt away. He may have worn that shirt the following Sunday and probably other Sundays as well. I wonder how many people noticed my boy wearing pink. Does this man look feminine? I think not. 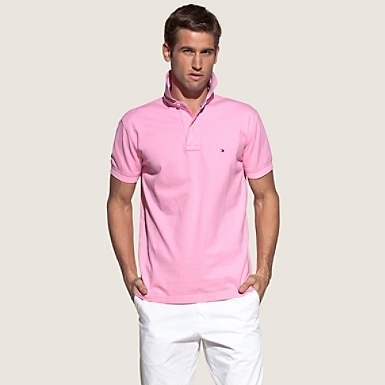 For further reading on fashionable dressing for men, check out this article Can men wear pink? 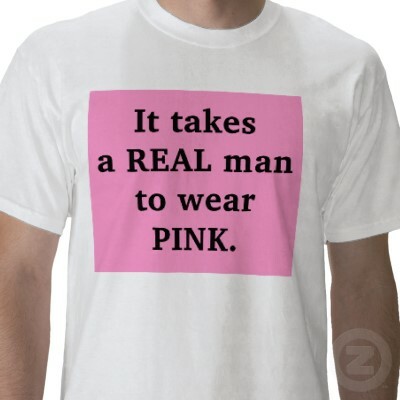 Decide for yourself if pink is acceptable for your man or men (if you have many sons as I do). I was there for the men not wearing pink…I must have missed women not wearing black. oh my. I can't imagine my wardrobe sans black! This falls under the category of "he who smelt it dealt it". It became obvious to me while attending this church that the reason there were so many rules about dress was that the pastor had a problem with his own sin issue of the eyes. His preaching revealed his fear of sins of the flesh with both genders. Not that I watch NFL, but feminine is the last word that would come to my mind when thinking of NFL ball players. Good point. You know, I had always added this kind of stuff to the list of "extra-biblical" rules used to control. I hadn't thought of anything beyond that. You've got me thinking now. A pastor cannot temptation proof his surroundings. I'm all for modest dressing. It is wise not to put on display what you are not willing to give to the world. But regulations such as skirt/dress lengths and what colors can be worn are more relevant to the issuer than to the wearer. I made the above observation because of pastoral comments such as "I do not look at a woman below the neck." We must all do the work of giving control of our hearts and minds over to the Holy Spirit before we cede the responsibility of keeping ourselves pure to others. Interesting. That's a new one for me. I don't recall him saying that (not doubting you, just don't remember it). I remember one time a lady stopped by the church during off hours when I was there (perhaps during praise and worship practice). He told us he didn't want to talk with her because she was dressed immodestly and asked for one of us ladies to go and talk with her. How would he know if she was immodestly dressed if he didn't look below the neck? hmmmmm . . . .
(I'm a different anonymous than the one above) I do believe that many times the thing that bugs us the most in ourselves is the thing we find most irritating in others – and the louder your defend yourself the more guilty you are – and I'm sure there are other similar phrases. I think this issue falls into one of those categories. I agree. Check this out: http://en.wikipedia.org/wiki/Psychological_projection and notice the psychological disorders associated with projection at the bottom of the article. I thought I'd highlight your "temptation proof his surroundings" with some additional thoughts. I'm a firm believer that if we remove all the "bad" elements from our lives, we will lack the resources to deal with them when they eventually appear. It is why I don't take extraordinary efforts to shield my children from all things bad. I KNOW they are hearing "bad" words at school or seeing inappropriate behavior, immodest dress, etc. I make sure they understand what is appropriate and what is not and, more importantly, how to handle or react stuff that is inappropriate. Funny how that has resulted in two boys who are regularly complimented for their behavior and how they handle themselves in adverse situations that occasionaly arise at home, church and school. It might interest you to know that the blue for boys/pink for girls thing is relatively new- as in about a hundred or so years ago. In the late Victorian view, light blue was more delicate and feminine, while pink was strong and vigorous. It was after the turn of the last century that it changed.I would also note that Henry VIII was not above wearing pink, and Richard I (the Lionheart) was wearing pink garments when he was crowned King of England. They were both strawberry blonds, and I would not dare to question the masculinity of either of them!I understand that at some point the prophet Mohammed made an offhand remark that he didn't care for the color yellow. One of his followers managed to whip that up into something of a ban, until he put a stop to it, saying that he preferred not to wear yellow himself, but had no problem with others wearing it. His favorite color was green. But hundreds of years later there are still Muslim clerics who rail against yellow.Making theological hay over colors that God created is ridiculous. I wear what is flattering, modest, and seasonally appropriate. If My husband is happy with how I look and that settles it for me. I bet he'd say I was going STRAIGHT to hell if he saw me in my kilt! You know what?….If I pay for it with MY OWN MONEY then I'll wear what I darn well please and this "pastor" can get over it! Who died and made HIM God? Obviously you have a rebellious spirit which Paul, Timothy etc would squash. Your making mountains out of mole hills shows you are only interested in one thing and that is to create as much animosity as possible. Your claims otherwise are empty words since actions speak so loud. Remember; Raise not your hand against Gods' anointed. If you are so knowledgeable start your own church and leave others alone.